This entry was posted in Book review and tagged 2013, book, crime, macmillan, review, reviver, seth patrick, thriller. I too have read Reviver, by debut author Seth Patrick. I’m not quite sure how it escaped you that Never Geary is actually Irish, a fact that is mentioned more than once, so for him to say “Shag” seems ok, especially given the fact that the author is himself Irish. I personally enjoyed this work immensely, and was gripped throughout. Looking forward to the next instalment. 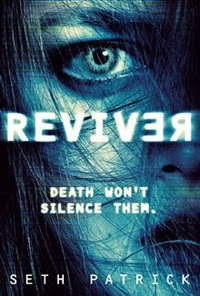 I haven’t had a chance to read Reviver yet, will have to wait for the official release if I want a copy. Now Simon, for all I know you may be right in what you say about the faults in this novel, I can’t comment on that. But come on, you missed something in the plot, and then admit to being overtired while you were reading it 😦 If you’re going to review someone’s work, the least you can do is be awake and giving it your full attention! I’m not saying you have to love it, tell it as you see it, but at least give the poor authors the courtesy of reading their efforts properly. I know you weren’t reading this with your professional reviewer hat on, but still…..
Of course, you are quite right Alison – I should have stopped at least until I was less tired and so could assess it all properly. I read it all in several sessions, and I must simply have missed the particular to the character being Irish, in this instance. However, I *did* look for references to Never Geary’s nationality but, again, I failed to find any – which is a fault on my part. It’s something I shall rectify in future,..
Hmm it seems like your website ate my first comment (it was super long) so I guess I’ll just sum it up what I wrote and say, I’m thoroughly enjoying your blog. I as well am an aspiring blog blogger but I’m still new to the whole thing. Do you have any tips and hints for rookie blog writers? I’d genuinely appreciate it. Two things in this case, Kyle: always be honest, and never read and review a book when overtired – as I did here, meaning I missed vital bits of information that put a whole new cast on certain things. Also, write as positively as possible about a book, even if it’s not your thing (unless it is SO bad that no redeeming features can be found – after all, any writer serious about their wishes to improve, and you can help them by pointing out where they went wrong as well as where they went right). It’s a two-way process I believe, between the author and the reviewer….